Doug Pederson tells Gunter Brewer to go back to college. When the Philadelphia Eagles finalize their coaching staff, they'll likely announce all the new hires and/or promotions all in one shot. To be determined when that happens. However, that doesn't mean that information of some of their additions haven't trickled out. Let's look at the staff, one-by-one, and determine where each current coach stands, and who is reportedly replacing the outgoing staff. What's next in the Nick Foles contract saga? • Doug Pederson, Head Coach: Obviously, Pederson isn't going anywhere. • Jim Schwartz, Defensive Coordinator: Pederson announced that all three of his coordinators -- Schwartz, offensive coordinator Mike Groh, and special teams coordinator Dave Fipp -- will all be back in 2019. Schwartz will also now have a "top aide" by his side in former Dolphins defensive coordinator Matt Burke. • Mike Groh, Offensive Coordinator: See Schwartz above. • Dave Fipp: Special Teams Coordinator: See Schwartz above. 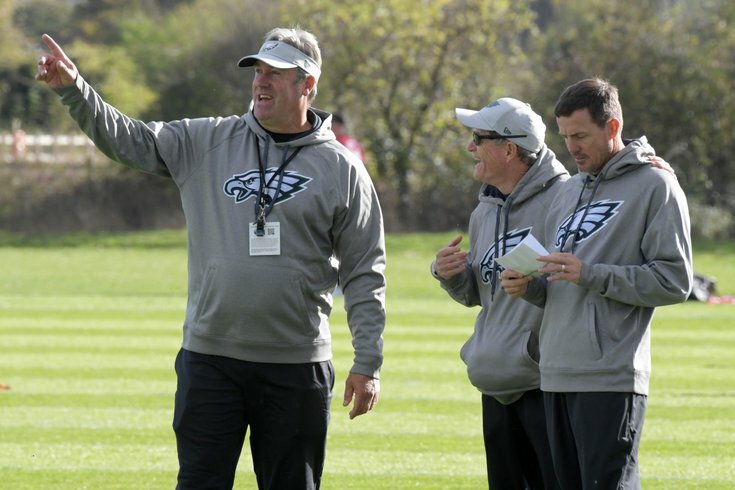 • Duce Staley: Assistant Head Coach, Running Backs: After Groh was chosen to be the team's offensive coordinator over Staley a year ago, Staley was still rewarded with the title of assistant head coach, and given added responsibilities. He isn't going anywhere. • Gunter Brewer, Wide Receivers: Brewer's tenure with the team lasted just one year, as he has already accepted a job coaching Louisville's wide receivers. My sense was that Brewer's messaging was better suited toward the college game, not professional athletes. That's not necessarily a slight, as Brewer was the college positional coach for guys like Randy Moss, Dez Bryant, and Justin Blackmon. He's just a better fit at that level of football. Replacing Brewer will reportedly be Carson Walch, per Ian Rapoport of NFL Network. Walch was already on staff as the Eagles' assistant wide receivers coach. He coached with Groh in Chicago in 2013 and 2014, when Groh was the Bears' wide receivers coach. Later, he landed in the CFL with various titles, most notably offensive coordinator for the Edmonton Eskimos, before being hired by the Eagles in 2018. Full bio here. • Ken Flajole, Linebackers: There has been no reporting on Flajole, who is 64 years old, so until further notice, the expectation here is that he will remain the Eagles' linebackers coach. • Tim Hauck, Safeties: Expected to stay. • Justin Peelle, Tight Ends: Peelle has received kudos from Pederson for his work with Dallas Goedert. He's not going anywhere. • Jeff Stoutland, Offensive Line: Stoutland isn't going anywhere. • Press Taylor, Quarterbacks: There has been speculation that newly hired Bengals head coach Zac Taylor, Press' brother, could try to hire Press away from the Eagles. The Eagles would likely block any such move, as would be their right, like they did with John DeFilippo two offseasons ago when the Jets tried to hire Flip to be their offensive coordinator. • Cory Undlin, Defensive Backs: Undlin did an outstanding job keeping the secondary afloat while dealing with an absurd number of injuries. He's not going anywhere. • Chris Wilson, Defensive Line: Wilson is moving on, as Geoff Mosher and Adam Caplan reported. The Eagles' talented defensive line was productive under Wilson, so it's unclear presently why he is on his way out. Taking Wilson's place appears to be Phillip Daniels, who will earn a promotion from Assistant Defensive Line and Defensive Quality Control. Daniels retweeted several tweets congratulating him on his promotion, like this one. • Eugene Chung, Assistant Offensive Line, Tight Ends, Run Game: The Eagles allowed Chung's contract to expire, per Jeff McLane of the Inquirer. He could get an opportunity to be an offensive line coach elsewhere. Taking Chung's place will be Roy Istvan, it appears. Istvan couched under Stouland for a brief period at Southern Connecticut State. He most recently coached at Kaiser University in Florida. • The Eagles are also expected to add Joe Pannunzio from the University of Alabama, per Matt Zenitz of AL.com. Pannunzio was with the Birds from 2015 to 2016 in a front office role. In 2017, he coached Bama's tight ends and special teams units. In 2018, he coached their running backs. To be determined what his role in Philly will be, but he could be another replacement for some of Chung's responsibilities with the run game. • Former Eagles camp quarterback G.J. Kinne was also added as an offensive assistant, per Bruce Feldman of The Athletic. • The Eagles are also adding former tight end and long snapper Mike Bartrum, per Jarrod Clay and Mike Martin of wchstv.com. He was the head coach at Meigs Local High School. The wchstv.com story states that Bartrum "has accepted a job as the tight ends coach." That is likely somewhat inaccurate, as it is more likely an assistant positional coaching job.